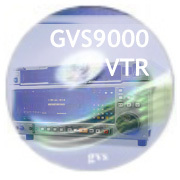 GVS90002U VTR offers a number of flexible options for DV to Uncompressed HD video, from single cameras, to as many as 16 concurrent capture, store and edit. (As new hardware is introduced, this number should grow) The key benefits and limitations are outlined below. The limitations are only based on the current software that available for real-time edit. The above workflow example is shown with 3 cameras and one mix station. You can start with a single unit or as many units as you require for your project. The key considerations are the video formats, storage requirements, flexiblity and cost that would be associated with each workflow. 90002U VTR offers dual gigabit interface, which users can select from to share their media over TCP/IP with numerous different protocols, from mixed user environment to shared video and audio capture. This provides the least expense and ease of sharing for multiple concurrent users. With dual firewire 800 users have the option of easily mounting GVS qualified firewire drives for capture or play back of the audio/video content, and easy transport of the content in a quick time native format. One user per drive and video format. This is an ideal format - very low cost, and high speed that is built into the GVS9000 2U VTR. For protection, data gets mirrored on two sets of drives at the same time on Nomadic product family drives. After completion of capture or playback, users can simply remove one set of the drives from the facility and transport them to any location, and directly attach to FinalCut, AVID, Flame, Inferno, Flint, Fire or Smoke. With multiple drive sets you can also accomplish higher video quality up to SD and HD. One user per drive set and high speed uncompressed HD video quality. A much newer storage technology that provides the speed and requirements for high speed uncompressed video and audio. This is an optional interface, and provides all the flexibility of SATA. One user per drive set and cost. SCSI interface is an optional interface that i the same as SAS for speed. One user per drive set, cost and not hot-swap. Fiber channel is the most ideal environment for more than one user and/or users in a live environment, offering both flexibility and reliability. 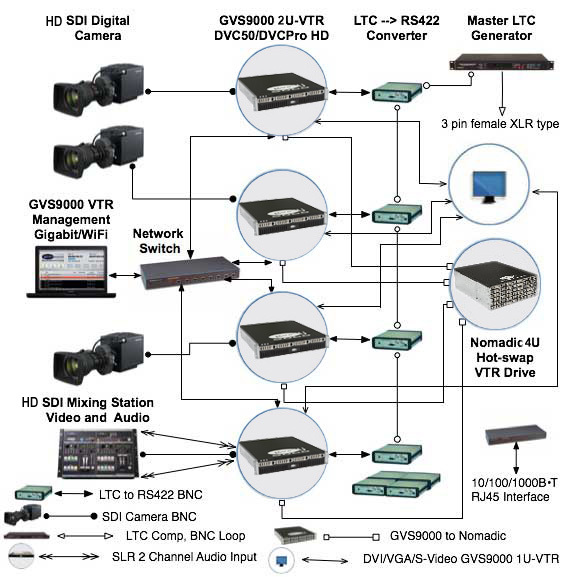 It provides multiple GVS9000 VTR devices to interconnect, with the highest video quality, allowing sharing of content over the fiber network, with numerous SAN software, and edit review can begin as data is being captured (GVSAN is offered at no additional cost with Nomadic4U line.) . For additional storage requirements, the Nomadic4U offers users expansion very easily and on-the-fly, without having any down time during the capture process. GVS9000 VTR machine control, connect a 9-pin RS-422 cable directly to the 9-pin connector on the back of the machine, optional breakout box provides all the above video connectivity, optional fiber optic connection available.